The definite integral of the rate of change of a quantity over an interval is the net change or net accumulation of the quantity over that interval. Thus, F(b) − F(a) is the net change in F(t) as t varies from a to b.
We’ve already illustrated this principle many times. Here are more examples. Let G(t) be the rate of growth of a population at time t. Then the increase in population between times t = a and t = b is given by The population may consist of people, deer, fruit flies, bacteria, and so on. is the number of people who will become infected during the next 4 weeks (or the total change in the number of infected people). Suppose a rumor is spreading at the rate of f (t) = 100e−0.2t new people per day. Find the number of people who hear the rumor during the 5th and 6th days. SOLUTION: 100e−0.2t dt = 74 people. If we let F ′(t) = f (t), then the integral above is the net change in F(t) from t = 4 to t = 6, or the number of people who hear the rumor from the beginning of the 5th day to the end of the 6th. Economists define the marginal cost of production as the additional cost of producing one additional unit at a specified production level. It can be shown that if C(x) is the cost at production level x then C ′(x) is the marginal cost at that production level. If the marginal cost, in dollars, is per unit when x units are being produced, find the change in cost when production increases from 50 to 75 units. We replace “cost” above by “revenue” or “profit” to find total change in these quantities. After t minutes, a chemical is decomposing at the rate of 10e−t grams per minute. Find the amount that has decomposed during the first 3 minutes. An official of the Environmental Protection Agency estimates that t years from now the level of a particular pollutant in the air will be increasing at the rate of (0.3 + 0.4t) parts per million per year (ppm/yr). Based on this estimate, find the change in the pollutant level during the second year. If the force is given in pounds and the distance in feet, then the work is given in foot-pounds (ft-lb). Problems typical of those involving computation of work are given in the following examples. 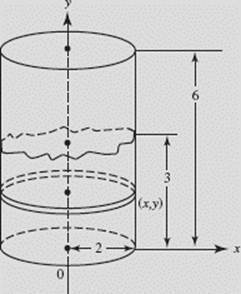 A cylindrical reservoir of diameter 4 feet and height 6 feet is half-full of water weighing w pounds per cubic foot (Figure N8–3). Find the work done in emptying the water over the top. 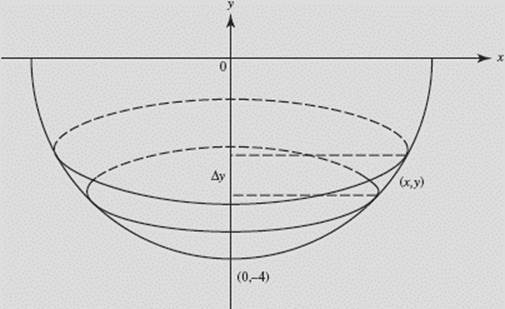 SOLUTION: The volume of a slice of water is ΔV = πx2 Δy, where x = 2. A slice at height y is lifted (6 −y) ft.
We used 3 as the upper limit since the reservoir is only half full. † The topic “work” is not specifically included in the Topical Outline, but it is an important application of integration. A hemispherical tank with flat side up has radius 4 feet and is filled with a liquid weighing w pounds per cubic foot. Find the work done in pumping all the liquid just to the top of the tank. In this chapter we have reviewed how to find the distance traveled by an object in motion along a line and (for BC students) along a parametrically defined curve in a plane. We’ve also looked at a broad variety of applications of the definite integral to other situations where definite integrals of rates of change are used to determine accumulated change, using limits of Riemann sums to create the integrals required.